Happy Friday loves!! its the weekend!! have an amazing weekend. I herd a lot about the hair mask and I finally got to trying it, some people liked it some didn’t, I like it and my mom loves it. 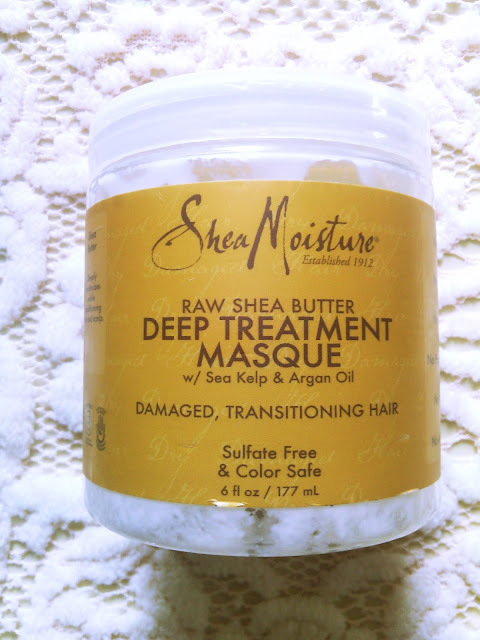 This hair mask contains sea kelp and argan oil with many others like castor oil, avocado oil, carrot seed oil, sage and shea butter just to name a few. It is great for damaged hair, transitioning hair or just great to use as a deep conditioner. It is sulfate free, colour safe, has no parabens, phthalates mineral oil or propylene glycol. This product is more on the natural side as you can see which is amazing for people who love organic and more natural products. As you may see I love shea moisture products for all my followers you have seen me review two of their body washes which I love. I like this deep conditioner it makes my hair feel so thick which i love seen as i have fine hair and also makes my hair feel so moisturized when i use it, my only con about this product is that when i do put it in and i’m to detangle my hair when it was permed it was hard to do so i had to either add oil or normal conditioner with it to comb through my hair, has anyone else had this problem? other wise I love this product and so does my mom, shes the one who uses it mostly when i got it she even tried it before me, when she saw the ingredients its like she took a dive for the bottle and tried it lol. Overall I do recommend this product 100% and i’m hoping to try more products from their line, so far I have been loving all the products I have used from them so far and also have you read their story and how they all started you should take a read on their site when you do have the time, very interesting story. I hope you enjoyed the post. don’t forget to share with others, Have you ever used this hair mask? what are your thoughts? Would you purchase it? Is it a staple in your haircare regimen? Let me know in the comments loves.